Room With A View - Luxury Apartment, Holmfirth, Yorkshire, England - 12 Minute Walk to Village - Large Private Patio. Very Peaceful, Amazing Views. We moved to Holmfirth 15 years ago and loved it so much that we've never left. Our two boys were born here and enjoy the local school and the fantastic outdoor spaces that this region has to offer. With lots of local knowledge and my love of the local restaurants, I am here to help you make the most of your relaxing break here. Please give me a call if you would like to find out more. 'Room with a View' says it all. The far reaching views across the valley are amazing and the peace and quiet are good for the soul. Add that to being less than a mile from the busy village centre, with its shops, restaurants and lively local activities, we can really say that our property has the best of both worlds. 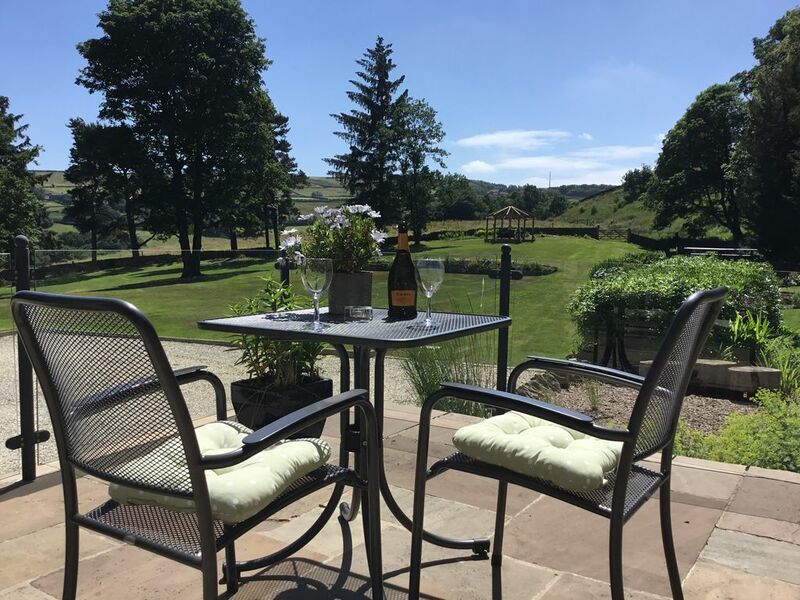 Whether you want to see a band at the famous Picturedrome, explore the local beauty spots, or just soak up the scenery in luxury surroundings we have just the spot for you. Shower room with WC and sink. On longer term stays I am happy to help out with washing. Double aspect with amazing floor to ceiling views down the valley. Sitting area with dining table. Wall mounted TV with FREEVIEW - radio and TV channels. Free WIFI. Huge library of books. Brand new fitted mini-kitchen. Two ring electric hob, fridge with freezer compartment, combination oven with microwave/oven/grill. Dining table for two. Large grounds and pond. Large private patio area accessed through French door, with table and chairs. Large gardens shared with owner. 45 minutes from Sno!zone, Castleford with real indoor snow. 2 miles from the famous Thongsbridge Tennis Club. Very close to Holmfirth village centre - 12 minutes walk. Private patio. Stunning views. Peaceful and secluded. Welcome basket on arrival. Renovated May 2014. Ample parking area. Towel / linen change weekly if multi-week booking made. The apartment was clean and warm with a super garden and lovely views. We had a very warm welcome. Regards, Siggi and Thora from Iceland. I booked up for my partner's birthday as a previous property had fallen through, and I am very happy it did to be honest. Such a beautiful little hideaway. Spotlessly clean and spacious self contained apartment attached on to the Owners House with glorious gardens and views. So peaceful, we could have happily stayed here all day enjoying the views and the sunshine. Loved the little touches such as the fresh eggs, bacon and butter as well as the extremely comfy bed and couch. Jenny was the perfect host and we will most certainly be back for another visit very soon. Thanks for your great review. Very much appreciated. So pleased you had a fab time. We have recently stayed for (only) two nights at this gorgeous location.The apartment was beautifully decorated and spotlessly clean and the welcome basket on arrival was such a nice touch with a handwritten card from Jenny which made us feel truly welcome. Everything in the apartment was perfect,from the comfy bed,kitchen area which was fully stocked to the big couch perfect for relaxing on whilst watching T.V or reading a book but for us,nothing could beat waking up to the birdsong and sitting on our own secluded patio and watching the wildlife busy themselves,squirrels,rabbits and pheasants all wandering around the garden just added to the beautiful views! Jenny is such a lovely person who made us feel “at home” and was so nice to us throughout our stay and although didn’t encroach on our time there was always on hand if we needed anything attall. If you’re looking for something wonderful then don’t hesitate to book,we can’t wait to go back again. So utterly pleased with the fact you had a lovely stay - it’s really what it’s all about for me. We look forward to welcoming you again as soon as you can get away! We stayed from October to December 2017 whilst we had some building work done at home. Although the building work was stressful it was lovely to have such a nice, comforting bolt hole to come back to. It was like a home from home and was everything we needed. The bed was really comfortable. The kitchen was all we needed. The views from the windows were brilliant, sometimes beautiful particularly with the snow and my excitement was actually seeing a mole peep out of the mole hill when I was using the telescope. Although we didn't use it for a holiday I would like to think we could return and do just that. I have saved the best until last - Jenny was the perfect host. Kind, thoughtful, nothing was too much trouble. She even texted me an early morning call when my husband was in hospital. Hope to see you again soon. Wendy. Thank you Wendy and Douglas for being such wonderful guests. We hope you are enjoying your new home now and things are less stressful! 10 picturesque reservoirs within 5 miles including Digley, Yateholme, Winscar. Walks of all levels right on the doorstep. Less than a mile into Holmfirth village centre. Holmfirth, featured in the TV series 'Last of the Summer Wine' is home to a many cafes, ice cream parlours, restaurants, wine bars, pubs and take-aways catering for every possible taste. You really are spoilt for choice in terms of the food options available. We have a swimming pool, post office and huge number of local shops and gift shops, a supermarket, and most of the high street banks. The Picturedrome (home to multiple live performances) is less than a mile away. Dubbed as the North of England's finest intimate music venue it offers a huge selection of live music events through the year - see www.picturedrome.net for more information. Holmfirth has it's own Vineyard (www.holmfirthvineyard.com) and Cider press (www.purenorthciderpress.com) both have their own cafe and tours. Watch out for the numerous local events such as Holmfirth Art Week, Holmfirth Food Festival, Holmfirth Folk Festival, Holmfirth Beer Festival and in 2014 we featured the Hill climb for the Tour de France. Scenery across the area is stunning year round. From snow covered hills in the Winter to bluebell woods and Summer picnics we have so much to offer. Shopping is excellent in the region with Meadowhall, The Trafford Centre, Leeds City centre and Manchester City centre all being relatively close. Booking Notes: Full payment is required 4 weeks in advance. 25% deposit required at time of booking. For booking less than 4 weeks in advance full payment is required. £100 damages/breakages deposit required - refundable. We accept bank transfer or cheques. Strictly no smoking, thank you. Changeover Day: Flexible. Check in is 2pm. Checkout is 11am, unless otherwise agreed. Notes on prices: Prices are for 2 person occupancy. Sorry no pets. Reductions for longer stays available.